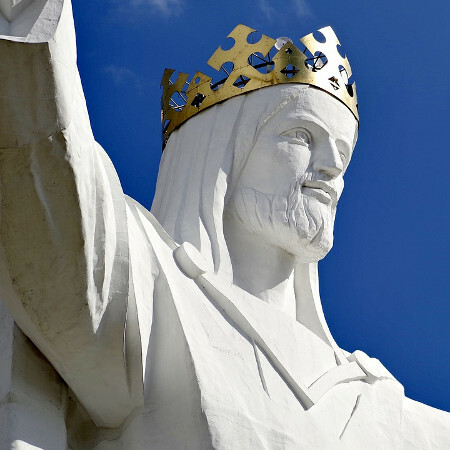 Christ the King Sunday is the final Sunday of the church year when we talk about how our God rules over all things. Sometimes it can be helpful to compare Jesus to other world leaders who world very powerful. So who was the most powerful earthly rulers ever? That depends on how you measure it. In 1920 the British empire controlled 28.3% of the world’s population. It is said that the sun never set on the British Empire. That would mean that King George the V the most powerful ruler because he was the monarch with most subjects. There may be other ways to measure power, of course, but it is an interesting conversation. That discussion spills over into Christ the King Sunday. How many subjects does Jesus have? I’m sure there were some who didn’t want to be under the control of King George, but they didn’t have a choice. In Paul’s letter to the Philippians he reminds his readers that on the Last Day every knee will bow who has ever lived. How is that possible? Because before that happens, Jesus will raise the dead. Our text is the tail end of the prophet Daniel’s vision of the four beasts. Those four beasts represented the four historical nations that would dominate the world stage and succession and set the stage for the Messiah to come. They were the Babylonians, followed by the Persians. The Greeks defeated the Persians brought with the their Hellenic culture and a common tongue across the world. Finally the Romans ruled with an iron fist that created the Pax Romana, a time of stability and peace. At the end of this vision we have a picture of Jesus. It’s not the baby Jesus in the manger that we will celebrate in a month. It’s not the suffering Jesus that we see hung on a cross as our sacrifice for sin. This is the conquering King of Kings who has come to end the world, before whom all must give an account of their lives. What will his verdict be for you? Where is your place in his kingdom? Want to hear these answers and more? Watch this Sunday’s message taken from Daniel 7.